KPCW, your nonprofit, community public radio station needs your support! Call in during our on-air Pledge Drive, March 4th - 7th and RECEIVE AMAZING ITEMS AS YOUR "gift with pledge". You can also find EXCITING ONLINE AUCTION ITEMS all week through Friday, March 8th! Our community relies on KPCW daily, and we rely on our nonprofit businesses twice a year during our pledge drives. 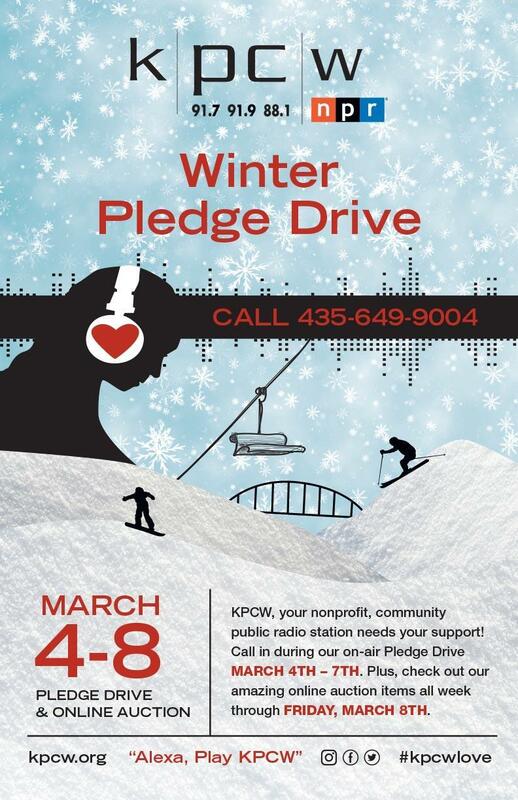 Each year, KPCW holds two Pledge Drives asking our listeners to support local, nonprofit, public radio and to support our mission to serve Summit and Wasatch Counties with local news, information, entertainment and emergency alerts through our broadcast signal and digital media platforms as well as to help other nonprofit organizations succeed in our community. Thank you to our wonderful local nonprofits and their sponsors who are hosting each hour of our pledge drive. KPCW is giving FREE underwriting to the nonprofits that raise the most money for KPCW and get the most phone calls! Be sure to call during your favorite organization's hour and help them win!